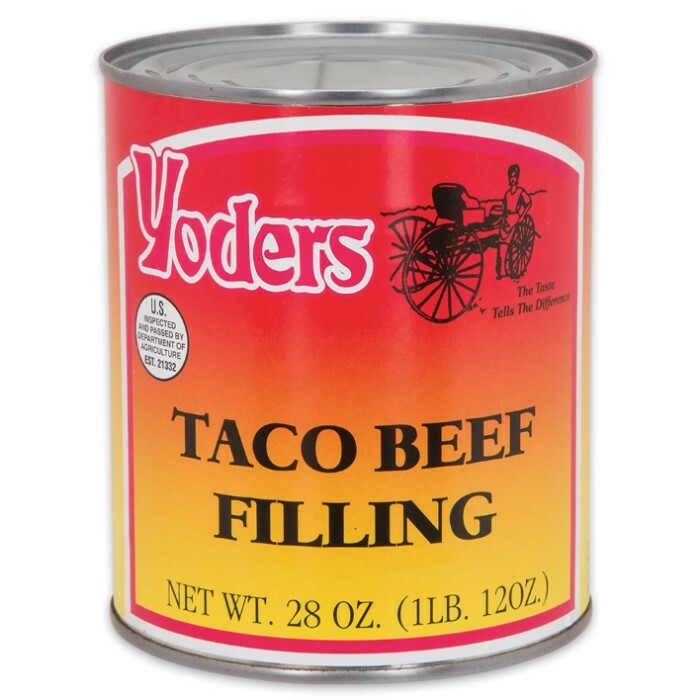 Yoder’s 28 oz Amish-Produced Taco Beef Filling in Vacuum-Sealed Can | BUDK.com - Knives & Swords At The Lowest Prices! Must-have for outdoorsmen, preppers, etc. Whether you’re preparing for the zombie apocalypse or just the next major storm, Amish-owned Yoder’s Taco Beef Filling is a delicious and affordable must-have for your emergency prep pantry. More than mere survival fare, it’s also a quick, convenient and tasty meal option for moms, college students and other busy individuals who don’t have time to brown, season and prepare fresh beef. Each 28-oz can contains 100-percent natural, USDA-inspected beef, raised on American soil by a hard-working Ohio Amish community (Yoder’s has been an Amish family tradition for more than 40 years in fact). It’s seasoned with a delectable blend of Mexican/Tex-Mex spices and is fully cooked and ready to eat; simply fill crunchy shells, wrap in a soft tortilla or stir into any dish calling for beef - chili, BBQ beef sandwiches, beef stew, spaghetti, even scrambled eggs, to name just a few; no browning, seasoning or other prep required! Thanks to the superior quality of the beef and Yoder’s advanced canning process, these beef chunks retain the same fresh-food taste and all the nutrition found in ground beef right out of the market cooler. The handy cans are compact, easy-to-carry and won’t occupy excessive space - a precious commodity in emergency shelters and crises caches. Non-perishable, it requires no refrigeration and is ideal for camping, travel and - with its 10+ year shelf-life - long-term storage. Whether for emergency prep, outdoor rec or convenient day-to-day meals, Yoder’s 28 oz Taco Beef Filling will make you wish your power would stay off forever! And with our unbeatable low prices, there’s no reason to wait to stock up! After all, you never know when the next crisis or disaster will strike, but with Yoder’s in your pantry you can rest easy knowing your belly won’t be empty. Indeed, “roughing it” never tasted so good!